With this chicken recipe, you could try duck legs instead of chicken. They will take a little longer and should be cooked until the meat is falling off the bone. You can also add heat with a couple of chopped red chillies or a teaspoon of chilli flakes. And if you want to save time, use tinned lentils – just drain, wash and add at the end. 1. Soak porcini in a cup of hot water for 10 minutes. Strain and reserve liquid. Chop porcini. 2. Heat 2 tbsp oil in a large cooking pot on a medium heat. Add onion, garlic, celery, herbs and salt. Cook for 5-7 minutes until starting to turn golden. Add tomato paste and flour and stir for 3-5 minutes, then add wine and chopped porcini. Bring to boil, then simmer for five minutes. Add stock and porcini liquid, then return to a boil. 3. Heat 2 tbsp oil in large frypan over a medium-high heat. Place half the chicken thighs in the pan, skin side down, and fry for about 3-5 minutes until skin is golden. Turn and cook for another minute, then remove and reserve. Repeat with remaining chicken. 4. Drain off excess fat from frypan and add butter. When melted, add carrot, parsnip and celeriac. Cook over a medium-high heat, stirring occasionally, for 5-7 minutes until golden. 5. Place reserved vegetables into the pot and chicken thighs on top, skin side up. Bring to a boil, then lower heat and simmer gently for 15 minutes. 6. Meanwhile, place lentils in a saucepan, cover with water and add olive oil, salt, garlic and thyme. Simmer over a medium heat for 20 minutes or until tender. Drain and discard garlic and thyme. 7. 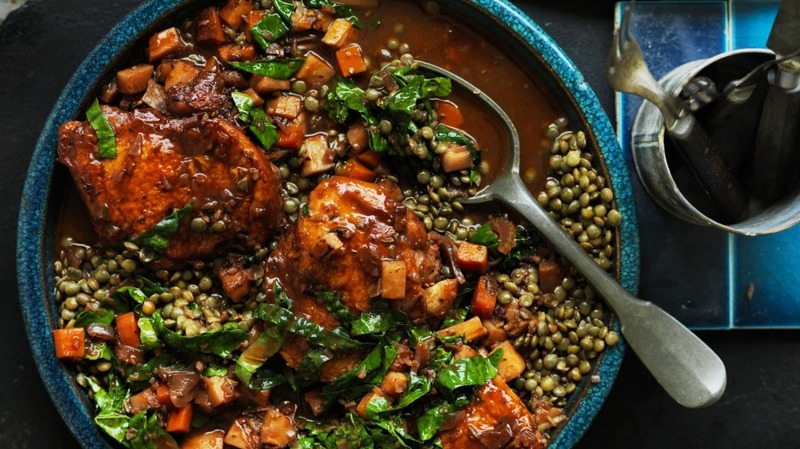 Add lentils into stew, along with the cavolo nero. Simmer until cavolo nero has softened, about 3-5 minutes, then serve.